Have four long pet walks a day become two short ones, instead? Are belly scratches and ball throws now a figment of your pet’s imagination? Do you often come home from a long day at work only to realize you forgot to pick up the pet food… again? As our lives become busier with work, family and everything else in between, finding convenient and comprehensive services has become a necessity, especially when it comes to our pets. As we buzz around trying to get everything done in 24 hours, it is often times our furry family members that end up with the short stick! Whether you need help with walking, exercising or special care for your pet, including drop-off and pick-up for vet visits and grooming appointments, as well as delivery of pet food and supplies and pet service referrals… Kat Walking Dogs is your answer! 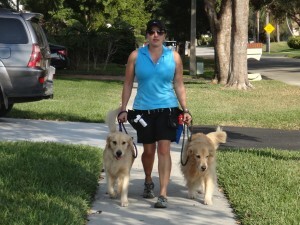 At Kat Walking Dogs, our list of tricks goes way beyond just sit and walk. As your very own personal concierge, we roll-over backwards for our Kat Klients and are your licensed, bonded, insured, certified and established “one-stop-shop” for everything pets! With more than 10 years of pet industry experience, Kat Walking Dogs has amassed a huge network of quality resources for anything and everything you might need, and is a trusted source for genuine, dependable, flexible, reliable and credible pet care and referrals. All of Kat Walking Dogs’ services are fully customizable and tailored to fit the special needs of our pets and pet parents, including care for geriatric, ill or injured pets. Some of our services include, pet sitting, pet walking, pet fitness, events and field trip activities, pet lodging, pet chauffeur accommodations and pet party planning, along with top-rated referrals for pet nutrition, supplies, training, grooming, health care and more. The mission of Kat Walking Dogs has always been, and remains to be, providing compassionate, competent and personalized pet care services. We uphold the highest standards in all aspects of caring for our Kat Walking Dogs’ family members and strive to exceed expectations, every time. Please feel free to contact us if you have any questions or need any additional information. We look forward to helping you and welcoming you as part of the Kat Walking Dogs’ family! *For questions about whether you are in our service area or to request customized services outside of our service area, please call for more information. Taking our time, paying great attention to detail and being well-informed and trusted is what we like to call the Kat Quality Care difference, and is why time and time again we are told that we are a leash above the rest! At Kat Walking Dogs we not only believe in quality personalized care, but also the importance of licensing, insurance, certifications, continuing education and industry memberships. PSA is the top-recognized Insurance Program for the pet-sitting industry. The American Red Cross is the trusted name in providing first aid. Founded in 1866, the ASPCA was the first humane organization in the Western Hemisphere. Their mission, as stated by founder Henry Bergh, is “to provide effective means for the prevention of cruelty to animals throughout the United States.” The ASPCA works to rescue animals from abuse, pass humane laws and share resources with shelters nationwide. They say you can tell a lot about someone by the company they keep… and since our Kat Walking Dogs’ clients are truly the best, I would say we are doing pretty great! Read below for just a few of the testimonials we have received over the years. We moved to Hollywood six months ago, and fortunately found Kat Walking Dogs almost immediately. We have four pets: two older cats — Largo and Maya and two large dogs – Cooper and Buddy, so at first, we were concerned about having a critter sitter who could manage the zoo crew. Our 4 1/2-year-old chocolate lab (Cooper) and our 12 1/2-year-old golden retriever (Buddy) both came with special requirements. Cooper is a foundling, starving on the streets in Coral Gables two years ago. As a result, he’s a bit food dysfunctional (meaning he eats everything in sight, and has gotten fat). BudBud, however is the challenge. He came to us two years ago as a senior rescue, and he’s Dr. Jekyll and Mr. Hyde: a sweet, loving golden most of the time, who becomes totally terrified at the first sound of thunder. Katt has made invaluable suggestions for managing the health of all the fuzz-butts, taken weight off Coop, and reassured Bud through major thunderstorms. We really appreciate how much she loves all animals, and the excellent care she’s taken of ours. It is such a relief to get a text or a photo or a call while we’re away, and know that everything is in her competent, capable hands. And did we mention that the crew LOVES Katt? They all run to her when she arrives (not just because she has a treat bag, either!) and clearly welcome the chance to spend time with her (Cooper does his patented ‘happy dance’). Our only hesitation in writing a testimonial is that — selfishly — we want Katt all to ourselves! Kat Walking Dogs is a top-notch pet sitting service. 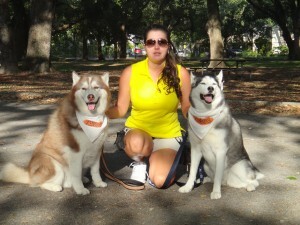 When we had to travel out of town for a week, Katt took care of my two Siberian Huskies. My female, Lexi, needs a lot of exercise, love and attention and she surely got more than she even needed from Katt. Katt was extremely reliable and dependable. I felt so good when she texted me every day, several times a day (at my request) to keep me updated on my doggies. From the first time I met with her, I realized that she genuinely cares and loves animals. Pet sitting is not only her profession, it is her passion. I am overly protective of my babies, but I can leave them with Katt and feel very confident that they are taken care by the best in the field. Without any doubt or hesitation, I highly recommend Kat Walking Dogs service. My husband and I were looking for someone to look after our new puppy when we went on vacation. We were so nervous to leave him with someone for such a long time. After I met Katt, my mind was instantly put at ease. I let her know that our Maltese/Poodle, Jack, might cry at night because he is used to sleeping with us. Kat didn’t even hesitate. She said, “If he sleeps with you, then he will sleep with me.” Imagine our surprise to find someone as dedicated as Katt to take care of our puppy! We got email updates every day we were on vacation telling us how Jack was eating and adjusting to his “play date.” He always looked so happy and content! When we picked him up, we were surprised by a little gift bag and a video showing us how much fun Jack had while we were on vacation. Katt makes sure our puppy has a vacation when we have a vacation. Jack loves Katt and loves being with her when we are away. I can’t imagine anyone but Katt taking care of our “baby” when we are away. Katt is THE choice when we need someone to watch our Jack. We’ve already booked her for our next vacation! My one-year-old female Siberian Husky, Bella, stayed with Katt while I went to Jacksonville for Thanksgiving and we were very satisfied with the service. What made this experience a little tough was that Bella was spayed the day before she went to stay with Katt for a week. Katt made sure that Bella took her medication as directed, struggled with Bella in finding a good cone to prevent Bella from licking her stitches, took her to the vet when she developed a slight infection and nursed her back to health. Between the photos and daily updates that I received via text message, I was reassured that I had made the right decision and I was able to enjoy my vacation alongside my family. I highly recommend Kat Walking Dogs! They treat my girls so good that we consider them family…And that’s the best thing in the world! When planning our 7-day vacation to Hollywood, FL from Washington DC, we couldn’t stand the thought of leaving our 7-month old little girl, FlipFlop. When making our hotel arrangements we were introduced to Kat Walking Dogs!! What a relief!!! I can’t express how happy I was to have Katt watch FlipFlop!! Katt sent us pictures of FlipFlop, daily updates AND even slept with her at night!! On the fourth day we took FlipFlop to a local dog park…When Katt picked her up to take her back for the remainder of our trip, FlipFlop was SO excited to see her!!! Knowing FlipFlop was only a mile or so down the road and in such good hands helped to make our vacation wonderful! When we picked up FlipFlop before heading to the airport, she smelled great and looked beautiful! It seems we weren’t the only one who had a great vacation… as did FlipFlop! Thankfully, we are planning to spend half the year in FL soon, because I can’t imagine leaving FlipFlop with anyone other than Katt!! I cannot begin to thank you enough for taking such good care of my baby girl Lilly! Lilly is still a puppy and requires a lot of time and attention making it difficult to just leave her with a friend or family member. I was hesitant to leave her at someone else’s home worried that if she had an accident or was “too energetic” the people would get easily frustrated with her and end up crating her the whole time. Much to my surprise, Lilly was the exhausted one! Katt did such a fabulous job of taking the time to play, walk and even set up a “play date” with my little ball of energy that she was pooped and well exercised the whole time she was there! Lilly ate well and stayed on her regular eating/sleeping schedule which was very important to me. Additionally, Katt took the time to send me photos and update me regularly in regards to how Lilly’s nights went, as well as how her days were going! I slept well and was able to enjoy my vacation with the family because I knew that not only were Lilly’s needs being taken care of, she was also being loved, cuddled with and played with more than I even get a chance to at home! It is a wonderful feeling to know that I never have to worry again about where I will “board” my sweetheart because I won’t go anywhere else but Kat Walking Dogs from now on! Thank you so much Katt! A true mama’s girl ever since I adopted her 14 years ago from the Humane Society, Shea has been glued to my side for better or for worse. While I love every moment of having her as my sidekick, her attachment to me became problematic whenever I would have to leave town for work or had to put in extra hours at the office. I tried time and time again to have trusted family, friends and neighbors help out but they would all call me and say the same thing, “Shea refuses to come with me and won’t walk. She pulls me back to the house and refuses to leave.” I knew very well what was happening, Shea was scared that these “evil people” were going to take her from me and she refused to let that happen… until she met Katt! I know they say that dogs know “good people” but it has to be more than that because all of the people I trusted to help before were good people, too. This was something different – it was if Shea sensed that not only was Katt “good people,” she meant business and was the “Alpha” in this relationship and wasn’t going to let Shea get away with anything. I remember watching them connect after their first meeting and sighing a big sigh of relief after their first walk when Katt instantly called me and said – SUCCESS! Katt is the only person I call now to take care of Shea and as Shea ages and needs even more special attention and treatment, I know that aside from me, when she is with Katt she is in the best hands! We are very fortunate to have found such an amazing pet sitter like Katt to watch our dog Koda for us when we are out of town. We don’t know what we would do without her whenever we have to leave, sometimes for as long as a week. She treats Koda as if she was her own, and we know that no one else besides ourselves would go to the lengths that she does to care for her like she is family. We know that we do not have to worry about her while we are gone and that she is in the best care we could ever ask for. Having Koda stay with Katt really allows us to enjoy a trip and keep us at ease, because she sends us several updates on how she is doing throughout the day and she gets lots of playtime and walks with her. 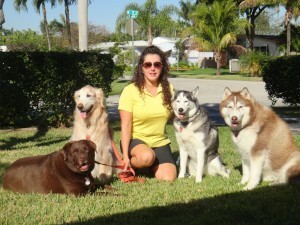 Koda really enjoys spending time with Katt as well as her two Huskies, Harlen and Lola. She feels like she is on a doggy vacation herself when we have to be away and she always has a hard time leaving Katt when we come back because of how well she is treated and the fun they have together. Katt always gives a personal touch to Koda’s stay by sending Koda home with a goody bag with treats, pampering her with a cute bandanna, making a video for us of her activities, uploading pictures of the fun they had and giving us a personalized report card for how Koda did while she was there. The attention to detail and the care that Katt gives Koda makes her worth every penny and we are very grateful to have her look after Koda for us. We wouldn’t trust Koda with anyone else and recommend Katt Walking Dogs very highly. You won’t believe the difference it makes when your pet stays with Katt and that you don’t have to worry about how your pet is being cared for while you are away. I used Kat Walking Dogs services while I went out of town. I have 3 dogs, 2 cats and 1 reptile. I was nervous about leaving so many animals to one person, but Katt was amazing. She took excellent care of all my animals, including one of my dogs who is a bit wary and skittish around strangers. She even texted me pictures of my pets while I was away, which reassured me that they were all doing fine. The house was perfect when I got home, and she even left adorable treat bags for all of them. I would HIGHLY recommend her pet services to anyone!! I have a 6-year-old Siberian Husky who needs a lot of exercise. I was recommended to Katt via a friend. I have to say that calling Kat Walking Dogs was the best move I ever made. Kiro has lost weight since Katt started walking him regularly. Equally as great, is the specialized concierge service she provides, which is convenient and allows me more scheduling flexibility. I can schedule vet or grooming visits for my dog and Katt picks him up, drops him off and brings him home. Having her around is a God-send. I would highly recommend her for any pet needs. Thank you for everything you do Katt. Katt is truly a professional and top-notch! She watches my cat Sylven and on top of not minding doing all of the little things I would do for Sylven, i.e. drinks out of the sink, patio time, TV time, etc… she leaves sweet little updates via phone and email, so no matter where I am, my mind is at ease knowing that Sylven hasn’t skipped a beat while I am gone. She is wonderful and I recommend her on the highest level for all of your pet needs! My dog Harley loves when we go on vacation and she gets to stay with Katt. I love it too because I know that she has been well cared for and that I don’t have to worry at all while we’re away. Katt truly loves animals and I am very confident leaving Harley in her care. 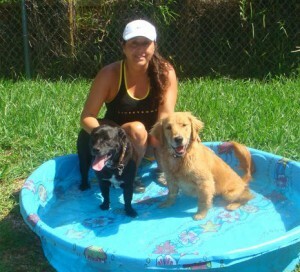 We are so thrilled to have found Katt to walk and jog with our two labs. She is an amazing person and our dogs love her and can’t wait to see her. We were extremely concerned when we moved from our house of 7 years to our current house as we had a great neighbor that would take care of our Golden Retriever while my wife and I went to work. Then I was introduced to Ms. Katt. Well we could not be happier with her and our dog absolutely LOVES her. All you have to do is mention Ms. Katt and he gets excited. She is always there for us and as a true pet lover I could not be more at ease knowing that our boy is being care for by Ms. Katt. We have also taken numerous vacations since meeting Ms. Katt and she has been there for us each time. Her communication skills and her passion to be around animals is a true blessing and we are extremely thankful that we were introduced to her and wouldn’t hesitate for even a second to recommend her to anyone needing pet-care services. I needed someone to walk my 2 Airedale terriers after my hip surgery. When I heard Katt was starting her service, I jumped at the chance to be a client. While walking my 2, I had observed Katt walking her dogs most mornings for over a year. So I knew for myself they were in good hands, no questions asked. But once we made an agreement for services and I had the surgery, I realized they were in GREAT hands. What a relief she was to me. I have great confidence and trust in Katt and Kat Walking Dogs. Katt has watched my Miniature Schnauzer, playing with her and walking her. I also have observed Katt walking her clients’ dogs. Kat has a genuine rapport with dogs and it is apparent in the care and concern she gives them. Lily, my 5 year old Siberian Husky absolutely loves Katt and her family. 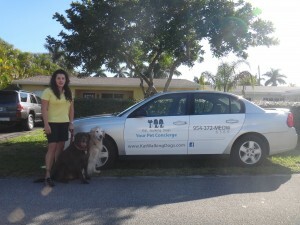 Kat Walking Dogs is dependable, trustworthy and a top shelf pet concierge service. I give it 4 Paws Up!